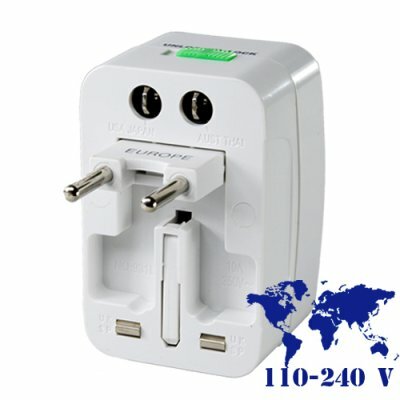 Successfully Added Universal Travel Adapter + Surge Protector for International Use to your Shopping Cart. International travel adapter with surge protection for worldwide use. A single all-in-one design allowing any of your home electrical products to be used around the globe! Whether you are taking your laptop on a business trip to Asia, a vacation with your HD video camera to South America, or traveling to just about any other major region in the world, then here is one universal wall adapter that will make your life much easier. With its all in one design, you simply plug your electrical device into this unit and then retract the connector for the region you are in and instantly you can plug your device into the wall socket. Its as simple as that! We are offering this wonderful global travel adapter at a quantity of at least 10 pieces in order to give you the absolute best re-sale profit margin from our low wholesale price and even better shipping rates. Brought to you from the leader in wholesale direct from China electronics, Chinavasion. on 2009-09-27 08:31:15 simply a great product!! !